The Ford Motor Company incorporated in 1903, manufacturing and marketing automobiles and commercial vehicles under the Ford brand. It has produced trucks and tractors since 1908 and small transit buses since 1936. The 1908 Ford Model T (“Tin Lizzy”) was produced in 1908-1927. The car industry was built around it. Approximately 16.5 million were produced over 20 years. Model T’s were manufactured in 5-seat touring car, 2-seat runabout, and 7-seat town car body styles. Each was mounted on a 100-in. wheelbase chassis. Ford’s assembly-line production reduced the touring model cost from $850 (1908) to less than $300 (1925). The Model T had an efficient 4-cylinder, 20 hp engine, which reached speeds of 40–45 mph (65–70 km/h). Early models were hand cranked to start. Models made after 1920 had battery-powered starters. The 2-speed transmission (2 forward, 1 reverse) was controlled by foot pedals. The spark and throttle were hand-controlled from the steering column. Fuel was gravity-fed. Failure to impede the spark prior to cranking the engine could result in broken arm/kick-back injuries. Additionally, the handbrake was unreliable on hills. The Model T originally came in a variety of colors. It was mass-produced only in black from 1913-1925. An optional electric starter was offered in 1919. One in 10 cars produced was a Model T. It remained the best-selling automobile 45 years after its production ended. The (ineffective) service brake was comparable to Chevrolet’s. The Model T had a 10-gallon fuel tank and ran on gasoline, kerosene, or ethanol. The Model T’s popularity was due to its low cost, durability, versatility, and low maintenance. It created “aftermarket.” Its drawbacks were its overall appearance, gravity-fed gasoline system, a more powerful reverse gear than forward/drive gears, and rough ride at higher speeds. The 1932 Ford V8 (Model 18/40) was Ford’s first car to run a flathead V8 engine. The full-size V8 was manufactured in a 2-door roadster, (“deuce”) coupe, cabriolet, or phaeton, a 2- or 4-door, hard or soft-top sedan, and pickup body styles. All were mounted on a 106-in. wheelbase chassis (1932), which was stretched to a 112-in. cross-member frame in 1933-34. The MSRP for coupes and roadsters was $490-$495. The MSRP for convertible sedans was $650. The 221 cu.in. (3.6 l.) flathead, single-cast V8 engine was initially rated at 65 hp (48 kW). Carburetor and ignition improvements increased its power to 75 hp (56 kW) in 1933 and to 85 hp (63 kW) in 1934. The V8’s top speed was 76 mph (122 km/h). The V8 Model 18 came in Standard or Deluxe trim with black fenders, wire wheels, and a rear- or side-mounted spare wheel. Options included interior leather or broadcloth, clock, single/twin side-mounts, luggage rack, and inside/outside mirrors. Competitors’ V8 engines were cast in 2-3 pieces and bolted together. Ford’s single-casting V8 was lighter (better power-to-weight ratio) and affordable, although it didn’t run as smoothly. It was $100 less than Plymouth’s, but $15 more than Chevrolet’s. Ford exceeded its competition in price and product, which made it difficult to keep up with demand. The First Generation 1964 Ford Mustang (“pony car”), invented by Lee Iacocca for the automotive youth market, was produced from 1964 to 1973. The First Gen Mustang was manufactured in 2-door hatchback, fastback, 2+2 seat coupe, and convertible body styles and mounted on Falcon chassis. MSRP for the low-end, hardtop, 170 cu.in. (2.8 l.) straight-6, 3-speed model was about $2,370. The 1964 Mustang also used the Falcon’s/Fairlane’s drivetrain, suspension, and interior, which were already in production. Alternators replaced generators. The 6-cylinder engine was upgraded to 200 cu.in. (3.3 l.) and 120 hp (89 kW). The V8 was upgraded to 289 cu.in. (4.7 l.) and 210 hp (157 kW). The drop-in fuel tank, set into a hole in the trunk, was only separated from passengers by the back seat. Rear-end collisions potentially ruptured tanks, setting the car on fire. Back-up lights were added on some models. Introduced at the NY World’s Fair, the 1964 Mustang quickly gained competition: Chevy Camaro, Pontiac Firebird, AMC Javelin, Plymouth Barracuda, and the First Gen Dodge Challenger. The 1964 Mustang got 18 mpg. No investment in additional parts was necessary because the Mustang was based on existing platforms. Engineers re-designed the fuel tank system in 1971. The 1925 Ford Model T Runabout Pickup was the first factory-assembled practical alternative to 1-2-horse wagons. The Model T Runabout Pickup had a movable tailgate, cargo bed, and heavy-duty rear springs. The rear of the 2-seater Runabout was cut and a 4-ft. long factory-installed box added. It sold for $281. The Model T Runabout Pickup had a 4-cylinder, 177 cu.in., 20 hp engine mounted on a 100-in. wheelbase chassis. It had the standard Model T 2-speed transmission. Model T Runabout Pickups only came in black with an optional electric starter. Competitors offered cheaper, reliable, assembly-line vehicles with options. Chevrolet models had three forward gears. The Model T still used two. Aftermarket companies (i.e. : Fordsons) invested less, selling Model T conversion kits (from car to tractor). The Model T Runabout Pickup ran on gasoline, kerosene, or ethanol. The Model T Runabout Pickup navigated narrow streets as well as rural roads. However, it was a new version of a vehicle that had not managed competitive upgrades. 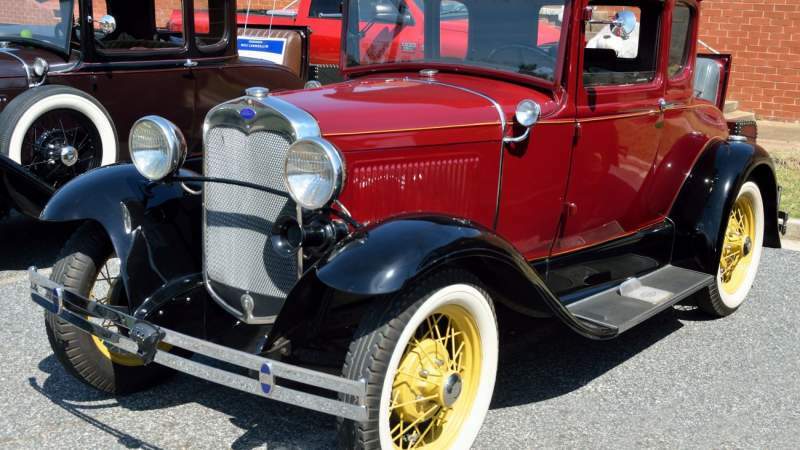 Ford cut production and sold Model T conversion kits instead. The First Generation Ford F-Series Pickups (“Bonus-Built”) produced from 1948-1952 replaced the car-based chassis. The First Gen F-Series was manufactured with 2-door pickup (F1-F3), 4-door panel, COE (cab-over engine) (F-5, F-6, C-Series), and school bus (F-5, F-6, B-Series) chassis. First Gen F-Series trucks had stronger chassis and level-action cab suspension. F1-F6 pickups had 226 (95 hp) or 254 (110 hp) I6, or 239 (100 hp) Flathead V8 engines. F7 and F8 pickups had 337 (145 hp) Flathead V8, 279 (145 hp) Y-Block V8, or 317 (155 hp) Y-Block V8 engines. A 215 (101 hp) I6 was also available. All first generation F-Series’ transmissions were manual 3, 4, or 5-speed. One-piece windshields (1948) and expanded rear windows (1951) were added for better visibility. First Gen F-Series had a wider cab and more-comfortable seating. Options included a foot-operated windshield washer, passenger-side windshield wiper/sun visor, passenger-side taillight, and chrome trim (F1). First Gen F-Series trucks were the first post-WWII trucks to use a truck platform. They were designed for comfort, utility, and safety, and sold in various cab and chassis configurations based on weight (F1 half ton, F3 one-ton, etc.). F1s had a 6½-ft. bed. F2s andF3s had an 8-ft. bed. Closest competitors were Chevrolet and Dodge. New engine types promised better fuel economy. The post-war design offered three new engines, integrated headlights, flat, one-piece windshields, and wider cabs. The F-Series has led in towing since the first generation.